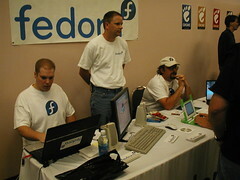 Fedora 16 is now using Systemd to enable, disable, start, stop, and restart many of its services. This is why it’s crucial for Linux users who want to manipulate services on Fedora 16 to know how to use Systemd. The video below shows you how to disable, enable, start, stop, and restart services on Fedora 16. Enjoy! This entry was posted in Linux and tagged Fedora, Fedora 16, Fedora Project, Gnome, KDE, Linux, Operating System, Systemd. Bookmark the permalink.